During circle time, have children find the letter and read portions of it each day. We has created a game which includes many surprises and lessons for your group. (Open game - Tooth fairy letter) Prepare a special envelope and leave it in an easy to find location in the daycare. During circle time, have children find the letter and read portions of it each day. Challenge them to use the tooth brushing chart (Open chart - toothbrushing). Invite them to add a pictogram whenever they brush their teeth. Nancy Hamelin has created a thematic letter. 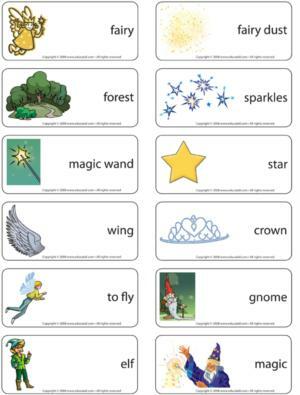 (Open thematic letter - Fairies) Print and insert into a flamboyant envelope. Read portions of the letter to your group when you see fit. Follow the instructions for fun with the fairies! Decorate with anything and everything which is sparkly or transparent to add a touch of magic! Hang stars, tulle, shiny curtains, small pink and white Christmas lights, butterflies, and flowers from the ceiling. Prepare a surprise for your group. Glue glow in the dark stars throughout the daycare. Turn off the lights and let them admire the decor! The pictures may be used as a memory game or to spark a conversation with the group. Use them to decorate the daycare or a specific thematic corner. 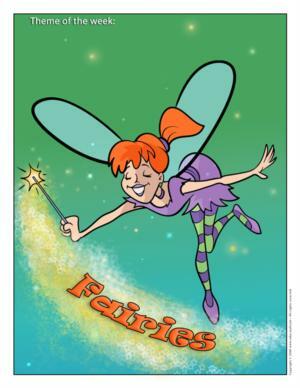 (Open picture game - Fairies) Print, laminate, and store in a "Ziploc" bag or in your thematic bins. Sparkles, sparkly glue, metallic confetti, etc. Tulle wings, jewellery of all kinds, colourful high heeled shoes, crowns, etc. Pastel-coloured modeling dough, add sparkles! Rhythmic batons (ribbon attached to a stick) and music! 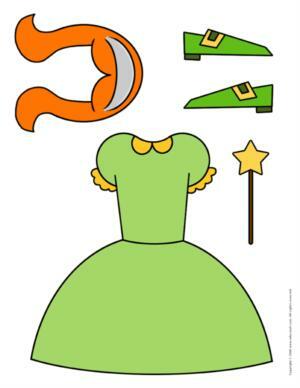 (Open picture clue story - Fairy Melody) Print. Sit in a circle with the group. Begin reading the picture clue story. Pause for each picture clue. Point to the clue and have children guess the missing word. Complete the activity with a craft and discuss the story. Divide the group into two teams: the fairies and the elves. Each team protects its treasure (object chosen by the team). Draw a line in the centre of the daycare to identify each team's territory. The elf team must attempt to penetrate the fairy team's territory and steal their treasure and vice versa. If a creature (a fairy for example) is in the other team's territory (the elves' territory) and is tagged by the other team, he is out of the game. (Open PDF teeth) Print and laminate. Place tiny pictures of teeth throughout the daycare. When you give the signal, children become tooth fairies and search for teeth. There is no winner. The goal is to have fun. At the end of the game, give each child a tooth to bring home. Give one child a magic wand. He is the fairy. The other children await the fairy's instructions. The fairy points her magic wand towards the group and states, "I will transform you into..." (frog, horse, table, etc.) Children pretend to become whatever the fairy says. After a few transformations, invite another child to be the fairy. Blindfold a child. Give tiny bells to one other child to hold in his hands. Children move about the daycare. When you give the signal, the blindfolded child must try to find the child holding the bells. Create an obstacle course. Fairies can fly, fit under obstacles, stop suddenly, walk, jump...anything is possible. Add a tiny bell at the end of each obstacle. When children have successfully overcome an obstacle, they may ring the bell. Provide children with butterfly nets. Encourage them to hunt for fairies. Touch a child's sweater, pants, or socks with a wand. He must name the item of clothing you touched. You may make the game more difficult by requesting they also name the colour of the item of clothing. Variation: Choose a different theme. Instead of clothing, play with body parts or the different rooms in the house. Use various objects in different corners of the daycare to represent places where fairies may live. For example, use the underside of a table to represent a cave. The top of a couch may represent hills while a sink may represent a waterfall, etc. Children follow your instructions and clues and move to the correct corner as quickly as possible. For example, if you say that fairies live near water, they should run towards the sink, etc. Deposit several items on a table (star, wand, etc.). Children observe the objects for approximately one minute. Cover the objects with a sheet. Remove one object. Show children the objects once again and have them identify the missing object. 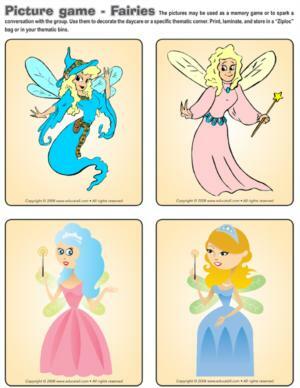 (Open story and memory game - Fairies) Print, cut out, and laminate the pictures. Place the cards face down on the floor. Children pick three cards and invent a story in relation to the illustrations. Variation: Print the pictures twice and use as a memory game. 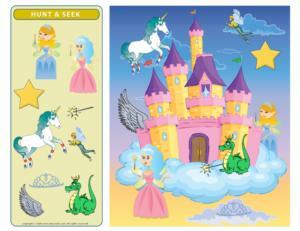 (Open Hunt and seek - Fairies) Print and laminate. Children pick cards and must find the elements in the scene. (Open paper dolls - Fairies) Print and laminate. Present children with the pieces. They will enjoy dressing the dolls. Add pillows and blankets to your relaxation area. Children pretend to sleep. One child plays the role of the tooth fairy. He hides a tooth under each child's pillow while singing a fairy rhyme. When the rhyme is done, children look under their pillow. The child who finds a tooth with a star on it becomes the next tooth fairy. Continue until everyone has been the tooth fairy. Set the stage for an imagination-filled relaxation activity. Tell children they are fairies. With their tiny wings, they fly above the daycare. Everything seems so tiny seen from above. It isn't very windy today, but the gentle breeze makes them sway from side to side. It feels warm and gentle. They can see the magical forest and everything that is happening throughout it like the bunnies looking for food and the birds flying right beside them. They see raspberry bushes full of ripe red berries. They would love to go taste them! As they fly towards the bushes, they spot their favourite flower. Oh, how they would love to snuggle up in it for a nap! That's exactly what they are going to do. Rocked by the gentle breeze, they nestle themselves inside the flower which smells so good. It's so soft and cozy. Deposit tiny straws and stars in a bin filled with flour. Have children search the "magic powder" for the items. You may add sparkles to the flour too. Bake an angel food cake with the group (store-bought cake mix or your favourite recipe). Change the name of the cake. Call it a fairy cake. The hole in the centre will represent a cave fairies hide in. Prepare edible paint by adding icing sugar to a bowl (approximately ½ cup). Gradually stir in a small quantity of egg white at a time and mix. At first, the mixture will be thick but after a few seconds, it will become more liquid. This is why the egg white must be added very gradually. Divide the mixture according to the number of colours you wish to have. Add food colouring to each mixture. Provide children with clean paintbrushes and invite them to paint their fairy cake. (Open craft model - Magic wand) Print and reproduce on heavy cardboard. Have children cut out the star and cover it with aluminum paper. Next, cut off the pointy tips of a wooden skewer. Children either paint their skewer or cover it with aluminum paper as they did with the star. Glue the star to the tip of the wand with hot glue. Roll a piece of construction paper to form a cone. Close it with tape or staples. If you choose to staple the hat, use adhesive putty to hide the staples. Cut stars out of aluminum paper and glue them onto the hat. You may also draw stars using shiny markers. Slide a piece of tulle or ribbon in the tip of the hat. You may also use a shiny ribbon (cut in two) stapled to either side of the hat to tie it under children's chin. d arms in the other bag. Children paint their wings white and cut them out. Next, they glue pieces of white tissue paper and sparkles on their wings. Glue the wings to the back of the other bag. They can simply slide their wings over their head. (Open creative coloring - Fairies) Print for each child. 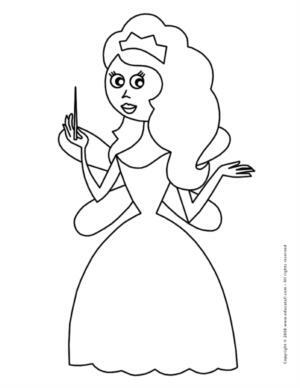 Children complete the picture by drawing what appears when the fairy uses her magic wand.